What Santa Sees - Santa flies over the world one more time on his way home on Christmas morning and sees children around the world celebrating Christmas. In this play, Santa travels to five diverse countries around the world and explores their Christmas traditions. The Christmas Tree Controversy - The ornaments on a Christmas Tree get into an argument about which one is the best and plays the most important role on the Christmas tree. Santa comes in to settle the argument. Deck the Halls - Pop-Up Video Style - This is based on a television show several years back called "Pop-Up Video" that showed music videos. Throughout the song, conversation bubbles would pop-up on the screen with facts about the song, the band, or the video itself. It was a really fun way of learning trivia about your favourite bands and music. 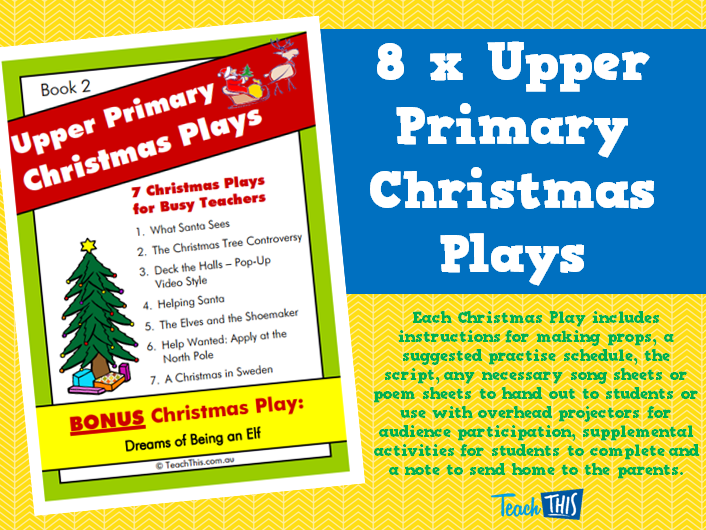 With this presentation the class will perform a classic Christmas carol, "Deck the Halls", while also presenting interesting facts about the song and the Christmas holiday. Helping Santa - Santa is exhausted as he tries to work through his “naughty” and “nice” lists, so the elves offer to help with some very simple maths and spelling. The Elves and the Shoemaker - This play is adapted from the classic children’s story by the Brothers Grimm. The story is about a poor cobbler who is visited by some crafty elves who make beautiful shoes for his shop. The cobbler and his wife do a good deed for the elves in return. Help Wanted: Apply at the North Pole - Santa has finally decided to retire and move to Hawaii. However, before he can do this, he has to hire someone to replace him. So he’s set up some interviews with potential replacements. A Christmas in Sweden - This program summarises the Swedish tradition of St. Lucia Day to honour St. Lucia, a young Christian girl who was martyred in 304 A.D. Like Christmas, the holiday has religious meaning, but has also become a fun family and community holiday. St. Lucia Day, December 13, is also Winter Solstice, the shortest day of the year in Scandinavian countries. St. Lucia is the bearer of light during the dark of Winter.